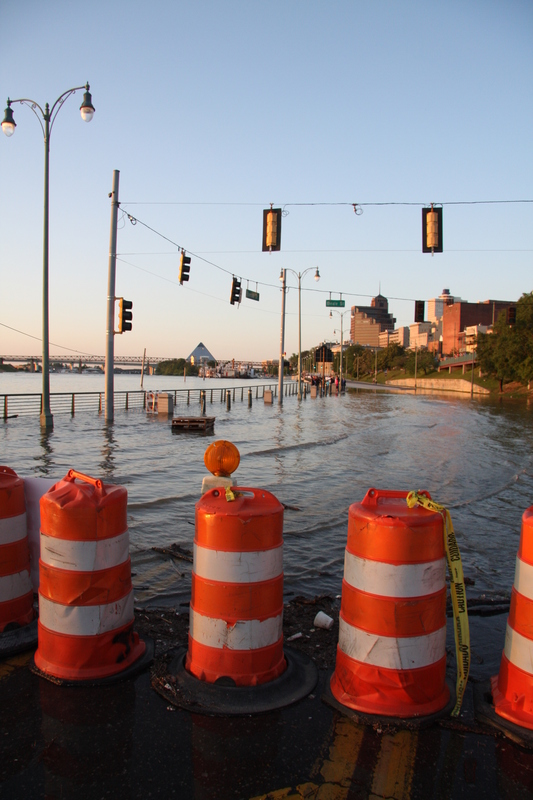 Mississippi Flood Waters Enter Downtown Memphis - JP loves LIFE! From the feedback I’ve received on my photo post that I put up Wednesday, I think I’m safe in saying that some folks would appreciate seeing photos of downtown Memphis as the Mississippi River continues rising. This evening, I returned down to the River and was so captivated by the views from mid-bluff (starting around Vance Park and continuing just past Beale) and Tom Lee, that I didn’t get back to some of the areas I was in the other day. Another reason is Tom Lee was still closed the other day as cranes dismantled staging from the music fest. But I’ll try to get to some of the other areas of the riverfront this weekend though. Today’s walk in downtown included the shocking site of significant water coming over Riverside Drive at the intersection with Beale Street. People were checking out every side of the intersection. The crowd was a lot thicker than earlier in the week. Lots of folks are trying to figure out where things like cobblestones used to go to. And while those things were shocking to me, I was overwhelmed by the sight I got and the sounds I heard as I got to Tom Lee Park. The water had come well into the park and was making the sound of waves hitting the beach. It was so hard to get my head around, I decided I had to take a short video on my Blackberry (am charging the video camera now so I may do better this weekend). Because I know some folks looking at the blog post may not realize how different the scene is from normal, I am pulling out a photo of my neices when we were at the river April 18th. You can see we are seated on a slope between the walk and the river. After the grassy slope was a steep rock wall. This section of the sidewalk behind them is no longer visible at all. My previous post providing sources of information on flooding areas, evacuations, resources to consult. etc. I’ve always been fascinated by the power of rivers. It takes a special breed to live by a river. It is wild to see it go! Like she said, it’s shocking, but worth a look for sure. Great pictures! I do hope that Immediate Response Group and other large organizations are able to help the bigger organizations get back up on their feet quickly – the quicker they control the flow of employees and assets in their companies, the easier things will get back to normal. Thanks James. We are beginning to hope we have about weathered the worst of it as forecasts call for crest soon and then it should start going down. We still feel lucky here compared to New Orleans after Katrina. The recovery will be hard on individuals and families but I hope that most businesses are able to come through this quickly, whereas they have a major rebuilding effort for years. I do hope things move quickly to rebound. I’m hoping for the same. Businesses are the core of the economy, and with the unsettling drop in produce from farmers (due to all of the flooding/drought in regions), they’re going to need all the help that they can get. Thank you so much Joan! We are still happily welcoming tourists still today so no worries, we will be ready when you get to booking that trip!